Junior Polydron fits together easily and stays together. 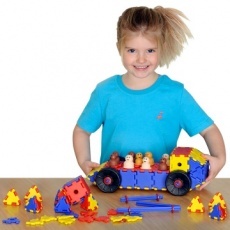 It is made from super durable polypropylene and designed to allow the easy construction of thousands of exciting models such as cars, planes and other fun models. The fantastic soft-touch wheels are easily pushed onto the product to create cool vehicles. Children will develop an understanding of how things work. They will learn how to grab, pull and push their models, which helps with their co-ordination and synchronises movement.